Future changes in extreme precipitation across the Northeast. Panels a, c and e show the number of days with extreme precipitation (> 95th percentile) and the total amount (mm) of extreme precipitation during extreme days (b, d, & f). Maps use RCP 2.6 (low emissions scenario), 4.5 (moderate emissions scenario), and 8.5 (high emissions scenario). Downscaling at state scale is not yet available. Figure courtesy of Liang Ning, ©American Meteorological Society. Over the past several decades, the Northeast has experienced a strong increase in the frequency and intensity of extreme precipitation events.22 Regional increases in heavy precipitation events exceed that of the rest of the United States with a 74% increase in the heaviest 1% of all precipitation events since 1958. Flood events have risen in association with increases in precipitation, particularly extreme events. This puts fish, wildlife, and their habitats at increased risk to direct impacts, such as physical damage, displacement, and mortality, as well as indirect impacts that result from increased inputs of sediments, nutrients, and pollution to aquatic systems. The largest increases in heavy precipitation extremes are projected to occur in the northern, coastal, and mountainous areas of the region.20 Some locations in Massachusetts, such as the eastern region, have shown an increasing trend in the number of days with two inches of precipitation or more since 1970.5,13 Annual maximum daily precipitation (the maximum amount of precipitation that fell within a 24-hour period over the course of a year) in coastal Massachusetts and the greater northern New England region has also increased by 1 to 2 inches since 1970.5 In addition, the Connecticut River basin has experienced more than a doubling of heavy rainfall events over the last 60 years. Regionally, the majority of heavy precipitation events have occurred during the summer months of May through September. Changes in the frequency and intensity of coastal storms and the interactive effects with sea level rise increases the vulnerability of coastlines and coastal habitats to these natural hazards. Information on coastal storms is described in more detail on the Coastal Storms page. Thunderstorms and other severe weather pose threats to fish and wildlife habitats through structural damage to trees, as well as erosion and riparian bank washout events. There is relatively less and sometimes conflicting information on observed and projected trends in storms compared to other areas of climate science, making it difficult to predict how these events may change in the future. Some evidence suggests the number of tornadoes per year has not changed much regionally since 1970. In the United States as a whole, there is some evidence that the number of days with tornadoes is decreasing, although the number of tornadoes per day may be increasing. Increased warming due to climate change could increase the frequency of severe storms that include tornadoes, damaging wind, and hail, particularly in the summer. Future studies in this area are needed to improve our understanding of the impact of climate change on severe storms and their impacts on natural resources. 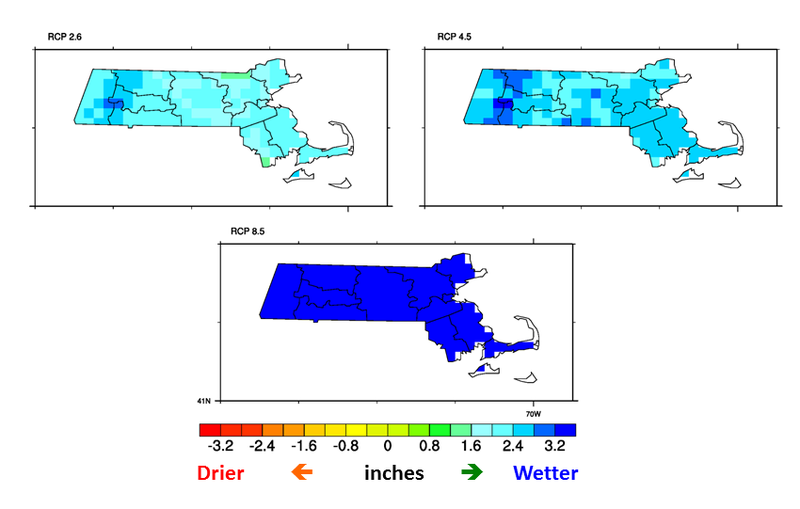 Changes in extreme precipitation (95th percentile) across Massachusetts using downscaled climate model data. RCP2.6 (low emissions scenario), 4.5 (moderate emissions scenario), and 8.5 (high emissions scenario) are used. Future projections of precipitation remain highly uncertain and should be interpreted with caution. Figure courtesy of Liang Ning. Future projections show that extreme precipitation events are very likely to continue to intensify during all seasons. Coastal Massachusetts is particularly at risk to extreme precipitation events with the interacting effects of coastal storms and sea level rise. In addition, these events are expected to become more numerous in Massachusetts, as well as the greater Northeast region, though with greater year-to-year variability. Winter storms, such as blizzards and ice storms, are occurring more frequently in the Northeast and Massachusetts. Severe snow and ice storms have more than doubled over the last 55 years relative to the previous 60 years. However, more precipitation is falling in the form of rain than snow. The impacts of winter storms vary and may be localized to particular areas of the State. Nor’easters (discussed on the Coastal Storms page) are a major driver of winter storms in Massachusetts, and observational evidence suggests that these phenomena are becoming more intense and occurring more often in New England overall than in the past. 1. Brooks, H. E., G. W. Carbin, and P. T. Marsh. 2014. Increased variability of tornado occurrence in the United States. Science 346:349-352. 2. Christensen, J. H., et al. 2013. Climate Phenomena and their Relevance for Future Regional Climate Change. Climate Change 2013: The Physical Science Basis. Contribution of Working Group I to the Fifth Assessment Report of the Intergovernmental Panel on Climate Change. T.F. Stocker, D. Qin, G.K. Plattner, M. Tignor, S.K. Allen, J. Boschung, A. Nauels, Y. Xia, V. Bex, and P.M. Midgley (eds.). Cambridge University Press, Cambridge, United Kingdom and New York, NY, USA:1217-1308. 3. Colle, B. A., K. Rojowsky, and F. Buonaito. 2010. New York City Storm Surges: Climatology and an Analysis of the Wind and Cyclone Evolution. Journal of Applied Meteorology and Climatology 49:85-100. 4. Del Genio, A. D., M.S. Yao, and J. Jonas. 2007. Will moist convection be stronger in a warmer climate? Geophysical Research Letters 34:L16703. 6. Emanuel, K., R. Sundararajan, and J. Williams. 2008. Hurricanes and Global Warming: Results from Downscaling? IPCC AR4 Simulations. Bulletin of the American Meteorological Society 89:347-367. 7. Emanuel, K. 2005. Increasing destructiveness of tropical cyclones over the past 30 years. Nature 436:686-688. 9. Report of the Northeast Climate Impacts Assessment (NECIA). Cambridge, MA: Union of Concerned Scientists (UCS), 160 p.
10. Gensini, V. A. and T. L. Mote. 2015. Downscaled estimates of late 21st century severe weather from CCSM3. Climatic Change 129:307-321. 11. Horton, R., C. Little, V. Gornitz, D. Bader, and M. Oppenheimer. 2015. Chapter 2: Sea Level Rise and Coastal Storms. New York City Panel on Climate Change 2015 Report. Annals of the New York Academy of Sciences, New York, NY:36-44. 12. Horton, R., G. Yohe, W. Easterling, R. Kates, M. Ruth, E. Sussman, A. Whelchel, D. Wolfe, and F. Lipschultz. 2014. Ch. 16: Northeast. Climate Change Impacts in the United States: The Third National Climate Assessment. J. M. Melillo, T. (.C.). Richmond, and G. W. Yohe (eds.). U.S. Global Change Research Program:371-395. 13. Horton R., W. Solecki, and C. Rosenzweig. 2012. Climate change in the Northeast: A Sourcebook. Draft Technical Input Report prepared for the U.S. National Climate Assessment. 313 p.
14. Knutson, T. R., J. L. McBride, J. Chan, K. Emanuel, G. Holland, C. Landsea, I. Held, J. P. Kossin, A. K. Srivastava, and M. Sugi. 2010. Tropical cyclones and climate change. Nature Geoscience 3:157-163. 15. Kunkel, K. E. 2013. Regional climate trends and scenarios for the US National Climate Assessment. US Department of Commerce, National Oceanic and Atmospheric Administration, National Environmental Satellite, Data, and Information Service. 16. Kunkel, K. E., et al. 2013. Monitoring and Understanding Trends in Extreme Storms: State of Knowledge. Bulletin of the American Meteorological Society, 94:499-514. 17. Miller, K.G., R.E. Kopp, B.P. Horton, J.V. Browning, and A.C. Kemp. 2013. A geological perspective on sea-level rise and its impacts along the U.S. mid-Atlantic coast. Earth’s Future 1(1):3-18. 18. Ning, L., E.E. Riddle, and R.S. Bradley, 2015. Projected changes in climate extremes over the northeastern United States. Journal of Climate, 28, 3289-3310. doi: 10.1175/JCLI-D-14-00150.1. 19. Tebaldi, C., B.H. Strauss, and C.E. Zervas. 2012. 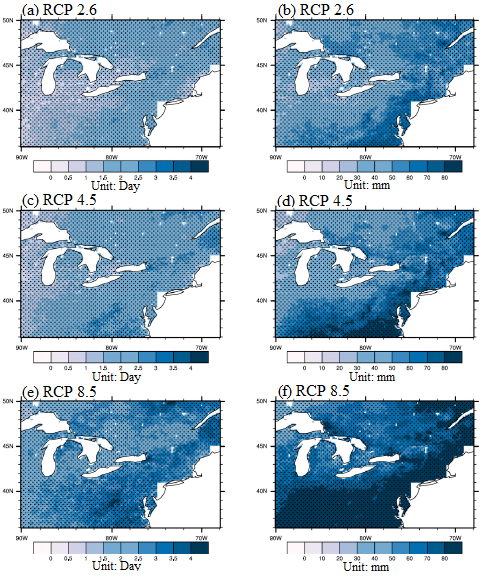 Modelling sea level rise impacts on storm surges along US coasts. Environmental Research Letters 7:014032. 20. Thibeault, J.M. & Seth, A. 2014. Changing climate extremes in the Northeast United States: observations and projections from CMIP5. Climatic Change, 127: 273. doi:10.1007/s10584-014-1257-2. 21. Ting, M., S. J. Camargo, C. Li, and Y. Kushnir. 2015. Natural and Forced North Atlantic Hurricane Potential Intensity Change in CMIP5 Models. Journal of Climate: doi:10.1175/JCLI-D-14-00520.1. 22. Walsh, J., Wuebbles D, Hayhoe K, Kossin J, Kunkel K, Stephens G, et al. 2014. Chapter 2: Our Changing Climate. Climate Change Impacts in the United States: The Third National Climate Assessment. J. M. Melillo, T. (.C.). Richmond, and G. W. Yohe (eds.). U.S. Global Change Research Program:19-67. 23. Webster, P. J., G. J. Holland, J. A. Curry, and H.R. Chang. 2005. Changes in tropical cyclone number, duration, and intensity in a warming environment. Science 309:1844-1846. 24. Yin, J. H. 2005. A consistent poleward shift of the storm tracks in simulations of 21st century climate. Geophysical Research Letters 32:L18701.